As we continue our column-by-column review of the single-phase motor specifications on page 13 of the AIM Manual, this week we find ourselves at the column marked PF, or Power Factor. If you read the recent post, Most Missed Question, you’re already a step ahead. In an AC (alternating current) system, voltage and current are not completely in phase. That is, their peaks and valleys don’t line up in perfect phase. This difference in phase between the voltage and the current is the power factor. As it turns out, the more in phase the voltage and current are, the higher the power factor. As a matter of fact, in the perfect world picture, the power factor is 100% (expressed as 1.0). In the real world picture, the power factor is around 75% (expressed as 0.75). Note that because the voltage and current can never be more than 100% in phase, power factor can never be greater than 1.0. Conversely, it can also never be smaller than 0. So what? Why does power factor matter? By the way, you may also note that the more efficient the motor, the higher the power factor. Hopefully by now you’ve realized that everything on this page works together. Next week we’ll move to the right to the Locked Rotor Amps column as we get closer to wrapping up the series. As we return to page 13 of the AIM Manual this week, this week’s post will focus on the column labeled Efficiency %. Simply put, electric motors take electrical energy and convert it into mechanical energy. That is, we put electricity into the motor and out comes the rotation of a shaft that powers a pump. However, it’s not a “one-for-one” conversion; we don’t get the same amount of energy out of the motor that we put into it. The energy that is lost in the conversion process gets turned into heat. This happens not just with motors, but with all devices that convert energy from one form to another. Perhaps the most obvious everyday example is a light bulb. Only a small portion of the electricity that goes into a light bulb comes out as light energy. The rest becomes heat, as anyone who has touched a lit bulb knows. This ratio between the amount of energy that we get out of something versus what we put into it is called efficiency. It’s generally stated as a percentage, but it can also be stated as a decimal. The efficiencies of Franklin Electric’s single-phase submersible motors are listed on page 13 of the AIM Manual. Like several of the other columns on page 13, there’s a column for full load (FL) and one for maximum load, also called service factor load (SF). [For an explanation of service factor, see the Franklin AID post on Full Load Amps and Max Amps.] Since the motor operates at or near service factor most of the time, we’ll limit our focus to efficiency at service factor, or the SF column in the table above. Using the 1 hp, 3-wire motor as an example, the table shows that the motor is 65% efficient. Once again, this simply means that 65% of the electrical energy that goes into the motor is available to turn the pump. This is a 1 hp motor, but to keep the units consistent, we’ll use the equivalent value in kilowatts, in this case 0.75. We’ll also convert this to watts by multiplying by 1000 (kilo=1000). So, mechanically, this is a 750 watt motor. Since there’s a service factor involved of 1.4, this motor is actually a 1050 watt motor (750 x 1.4 =1050). This matches the 65% listed in the efficiency column. Keep in mind that so far, we’ve just covered motor efficiency. The pump’s not going to be 100% efficient either, but we’ll cover that in another post. In actual practice, the efficiency of smaller single-phase motors is generally not too critical. Because it actually costs so little to run a residential single-phase motor [refer to the Franklin in the Field post The Deal of a Lifetime], efficiency gains may only result in pennies of savings per day. Efficiency becomes more important, however, in applications with greater power consumption. Next week we’ll move on to power factor in our attempt to make the numbers make sense, column-by-column. When we left Single-Phase Motor Specifications on page 13 of Franklin Electric’s Application, Installation, and Maintenance (AIM) Manual at the last post, we were ready for the column titled Winding Resistance in Ohms. Single-phase motors have two windings, a start winding and a run winding. Technically, when the motor is a capacitor start/capacitor run type, these are called the auxiliary winding and the main winding respectively. However, we’ll just use the terminology of start and run windings to keep things simple. Measuring winding resistance is a power-off check. Power must be disconnected and locked out. Starting with 2-wire motors, winding resistance is measured between the two black motor leads. 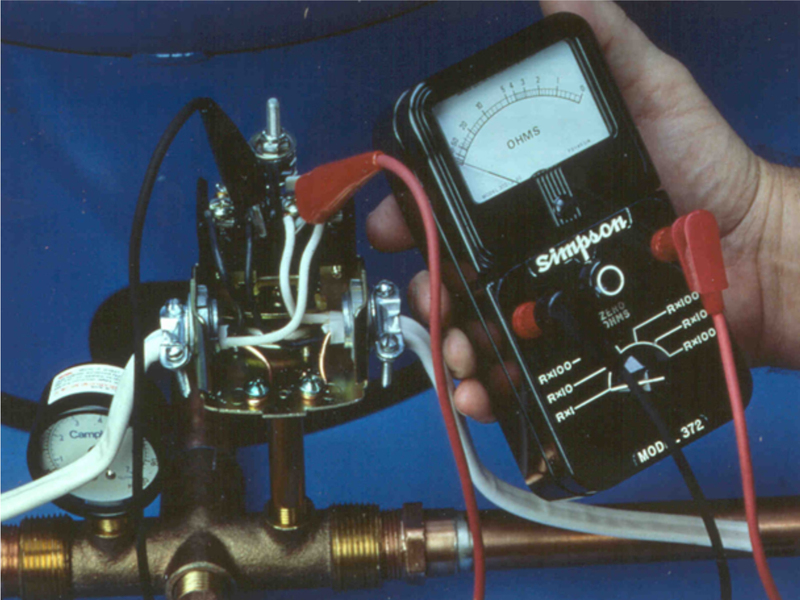 This can be done at the motor, at the well head, or even at the pressure switch. Referencing Table 13, the first thing noticed is the single row of values listed for 2-wire motors. For example, the ½ hp, 230 V 2-wire motor lists the winding resistance as 4.2 to 5.2 Ohms. This is the resistance of the run winding. But wait, where’s the value for the start winding? The answer is that because these are 2-wire motors, we don’t have access to the start winding. It’s there, but since this is a 2-wire motor, we can only measure the winding resistance between the two black leads; only one reading can be taken. Notice that a range of values is provided, not exact numbers. And in reality, if you get something close to these numbers, the winding resistance is probably good. In the case of 3-wire motors, winding resistance is measured for both the start and run windings. The main winding resistance is measured between the black and yellow leads. The yellow lead is the common here, and the start winding resistance is measured between the yellow and red lead. There’s no need to memorize this, since it’s in Footnote 1 at the bottom of the page. Using a ½ hp, 230 V 3-wire motor as an example this time, we see that the main winding resistance is 4.2 to 5.2 ohms (same as the 2-wire motor). The start winding resistance is 16.7 to 20.5 ohms. Winding resistance for 3-wire motors can be measured at the motor itself if it’s out of the well, at the well head, or at the control box. Regardless of 2-wire or 3-wire, what does winding resistance tell us? When troubleshooting and measuring winding resistance, we’ll generally get one of three readings: zero, infinity, or a value close to what’s listed in the table. If the reading is zero, which indicates the winding is shorted. If the reading is infinity, which indicates the winding is open. In either case, the motor will need to be replaced. If the measurements are being taken at the well head we’ll also want to check the drop cable. Winding resistance is one of two electrical checks, insulation resistance being the other, that tell us the electrical condition of the motor. If both the insulation resistance and the winding resistance are good, our motor is good from an electrical standpoint. It tells us that in terms of troubleshooting to look other places. By the way, we’ll cover insulation resistance in another post. In the last post we explained service factor: that electric motors aren’t necessarily what is on the nameplate in terms of horsepower, they’re actually more. This difference is service factor. Read more about service factor in the post Column-by-Column: Motor Model and Rating. Service Factor comes into play in the four columns in table 13 of the AIM Manual labeled Full Load and Maximum Load. 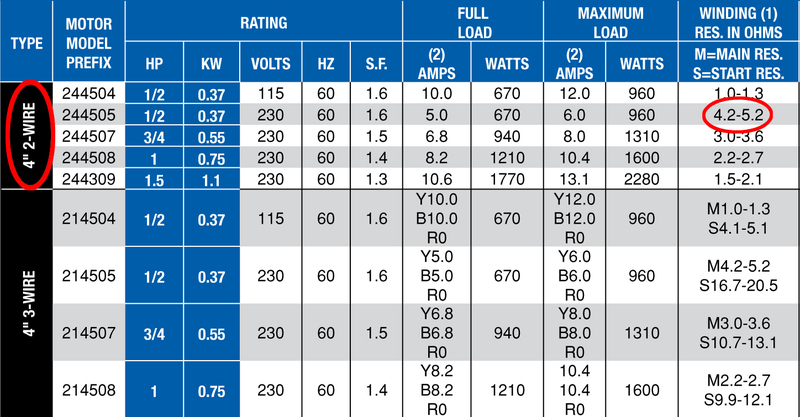 These columns list current draw in amps and power consumption in watts. Let’s begin with amps. Once again, notice there are two sets of columns: Full Load and Maximum Load. Full Load is the expected performance of the motor at the rated or nameplate hp. For example, if a 1/2 hp motor were delivering exactly 1/2 hp of power to the pump, it would be operating at Full Load amps. Maximum Load is what the motor would be delivering when service factor is included. As a result, Maximum Load is often also referred to as service factor amps or max amps. 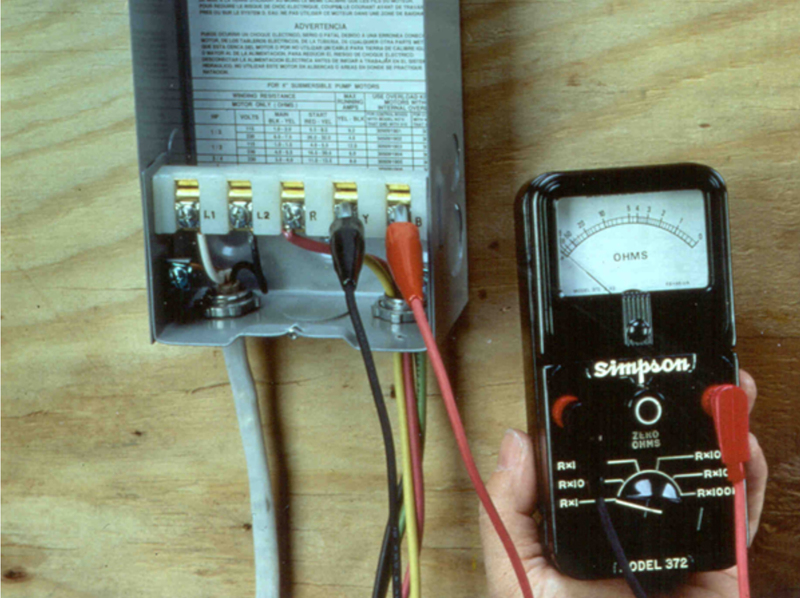 Taking the 1/2 hp, 230 V example, when delivering 1/2 hp to the pump it draws 5.0 amps. However, if that same motor operates at its service factor of 0.8 hp (1/2 x 1.6) it draws 6.0 amps. In most installations, motors operate near the Maximum Load. Also note that these values assume the voltage at the motor is the nameplate voltage, in this case 230 V. If the voltage at the motor differs from this, the amperage will be slightly different. The usefulness in having these numbers is that by measuring the current with an ammeter, we can determine how hard the motor is working. The more water we’re moving, the more electricity (current) the motor will need. For example, if we measure the current draw of the motor and it’s less than the Full Load value, that tells us the motor isn’t working very hard. Meaning, we’re pumping on the left side of the curve, we have a loose impeller, or possibly a pump “gulping” water. If a motor’s amperage is measured and it’s over Maximum Load (service factor amps), it indicates that the motor is working too hard. This could be an indication of a binding pump or a case where we’re pumping on the right side of the pump curve. Note: 2-wire motors only have a single row of figures. However, the 3-wire motors have 3 rows of figures representing the yellow, black, and red leads of a 3-wire motor. This points out an important difference between 3-wire motors without and with run capacitors. In the models without run capacitors, the red lead shows zero. This is because the start winding in these motors is only used for starting the motor. It comes out of the circuit as soon as the motor comes up to speed. However, the remaining 3-wire motors with run capacitors all list current in the red lead. This is because in these motors, the start winding stays in the circuit after the motor has started. So, no run capacitor in the control box means zero current in the red lead. A run capacitor means there should be current in the red lead. Next week, we will take a look at the column headed Winding Resistance In OHMS. We’ll see that it contains some especially valuable troubleshooting information. 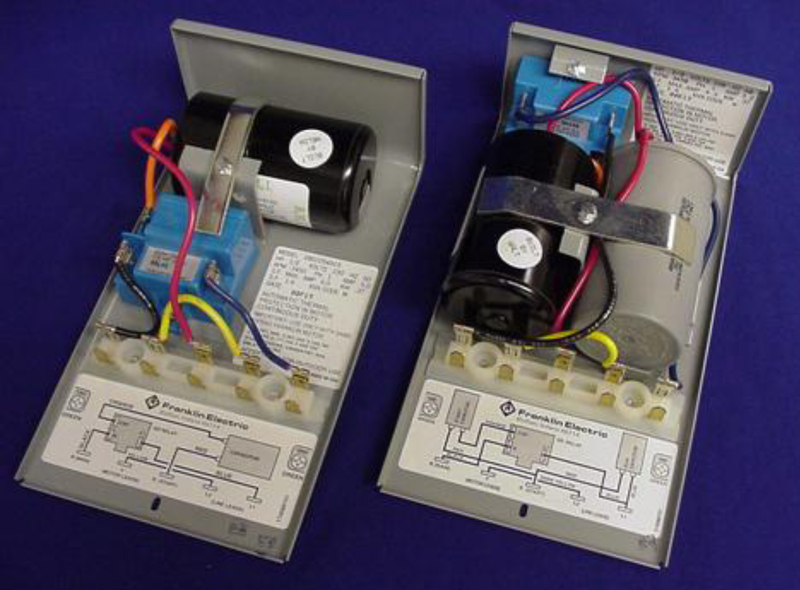 Some Franklin Control Boxes have only black colored capacitors while some have both black and gray capacitors. Why? Black capacitors are start caps. Start capacitors are used to start the motor and are then switched off by the relay. Gray or silver colored capacitors are run caps. Run caps help start the motor and then continue to provide energy to the start winding after the start capacitor turns off, making it an auxiliary or helper winding. This extra energy in the auxiliary/start winding improves the operation of the motor and makes it slightly more energy efficient. We previously established the wealth of knowledge held in the AIM Manual for contractors and installers and the two pages that stand out (pages 13 and 14). Packed with information essential to single-phase motor installation and troubleshooting, we continue in this post to review pages 13 and 14 column-by-column. Again, if you are dealing with 50 Hz motors, you will need a 50 Hz AIM Manual. Also, for those dealing with a 3-phase motor, please reference the table on page 22 of the AIM Manual. This series will focus on Franklin single-phase submersible motors.